Ready for the 802.11ac wireless protocol? Overall, the Netgear R6250 does a very good job of combining advanced networking tools with an easy-to-use interface, though the striking design won't be to everyone's taste. If you're still using the free modem and router you got from your ISP when you signed up for your broadband service, then you're missing out on a lot of the new home network technology that's come out in the past few years. A lot of people stick with these free routers because they essentially do what's needed of them – they share the internet throughout the home to wired and wireless devices. However, your home network can be so much more. The Netgear R6250 Smart WiFi Router is aimed at people who want to make the most of advances in networking technology, without having to mess around too much with various settings. But is a router that combines power with plug-and-play ease too good to be true? The Netgear R6250 Smart WiFi Router is up against devices such as Netgear's own R6300, the D-Link DIR-868L and the Linksys EA6500, as other 802.11ac routers that are vying to replace the free router in your living room or study. The first thing you notice on opening the box is the design of the router. This will surely prove divisive. The minimalist black square that emerges from the packaging is far removed from functional-looking routers such as the Buffalo AirStation N-Technology HighPower ADSL2+ Modem Router and the TP-Link Archer C7 AC1750, and Netgear has clearly got its designers to come up with something that we'd be happy to have on display in our homes, rather than hidden away behind a bundle of wires. Whether or not they've succeeded will be down to personal taste, and while the look might not be our cup of tea, we've certainly seen uglier. On the front of the router are four icons that are illuminated depending on the state of your network and internet connection, as well as information if a USB device is connected or not. On the side of the router are buttons for switching the Wi-Fi on and off, and for connecting devices via WPS. On the back are five gigabit Ethernet ports (one of which is dedicated to hooking up to your modem – more on that later), a reset switch, power button and a USB 3.0 port. A lot of routers include USB ports these days, making it easy to share an external hard drive or printer with all the PCs connected to the network. However the addition of a USB 3.0 port, rather than the standard USB 2.0, is certainly welcome. Given the increased speeds of the 802.11ac wireless protocol that the Netgear R6250 Smart WiFi Router uses, it would be a shame to bottleneck the data transfer speeds with low USB 2.0 bandwidth. The Boradcom BCM4708 processor that sits inside the Netgear R6250 does a good job of running the new 802.11ac protocol as well as dealing with traffic via the USB 3.0 port. Installation through the web interface was quick and easy, and rather than having to type in an IP address to access the settings, you can just type in http://routerlogin.net, which makes things easier to remember. Of course, if you're sensible you'll bookmark the page in your browser. The web interface clearly reflects Netgear's goal of creating a product that is easy to use for beginners, yet offers access to more advanced tools for experts. The wireless antennas (three 5GHz and two 2.4 GHz) are built into the body, so unlike routers with external antennas, you can't position them to broadcast in certain directions. It's not a deal breaker, but if you've got a blackspot in a certain part of the house then manually adjustable antennae can help improve wireless coverage. This comes across a case of Netgear choosing aesthetics over functionality, which seems out of step with the general design of the R6250. Once set up we were able to look closely at the features included with the Netgear R6250. These include DHCP, Static, PPPoE, PPTP and L2TP support, a built-in dynamic DNS client for dyndns.com, WAN port scan and DoS protection, IPv6 WAN connection support (auto-detect, 6to4 tunnel, Pass through, fixed [static], DHCP, PPPoE, Auto config), partental controls via OpenDNS, UpnP and DLNA media support, and SMB, HTTP, HTTPs, FTP storage sharing. For most home users this lot should be absolutely fine, though for more advanced tools like IPv6 port forwarding and firewall support, you're going to want to look elsewhere. For programmers wanting to play around, the router and firmware comes with a GNU General Public License Version 2. In our tests the Netgear R6250 performed pretty well, broadcasting two separate SSIDs for each band simultaneously. On the 5GHz band we saw very impressive data transfer rates of 593 Mbps, and while performance dropped the further we moved our test machine from the router, we were still able to get decent performance across a two bedroom flat over two floors. The Netgear R6250 comes with a wealth of features and tools that can help you transform your home network. Even better, these tools and features are presented in a way that means you don't need to have much networking experience to get the most out of them. What's more, it's also reasonably priced. The Netgear R6250 achieves its modest goals, but there are other routers out there that offer even more features for network-savvy users. The design of the R6250 might not be to everyone's taste either. 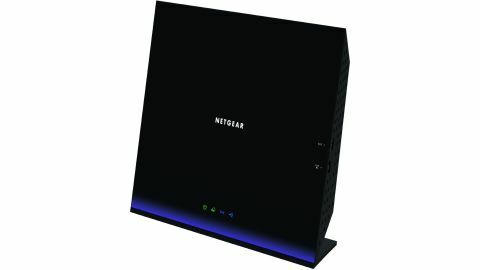 A successful marriage of advanced features and user-friendly design, the Netgear R6250 is a great choice if you're looking to replace your ISP's free router.